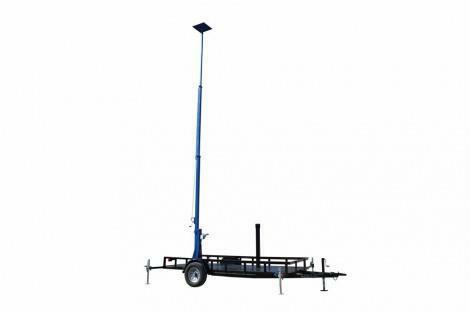 (MENAFN - Newswire.com LLC) KEMP, Texas, April 15, 2019 (Newswire.com) - Larson Electronics , a Texas-based company with over 40 years of experience spearheading the industrial lighting sector, announced the release of a three-stage fold-over light mast mounted on a trailer with wheels. This unit allows operators to safely deploy lights, security cameras and other equipment to elevations up to 20 feet. This unit allows for 360˚ of rotation and a removable mast head for easy storage. The LM-20-3S-TLR-MOD1 telescoping three-stage light mast can be extended to 20 feet and collapsed to 10 feet and is made of square steel tubing with a lower section measuring 10 feet long and 4' in diameter, a middle section measuring eight feet in length and 3.5' in diameter, and an upper section measuring six feet long and 3' in diameter. Each section has a two-foot overlap and the mast is elevated via an included 1,000lbs hand winch with 3/16' cable. Larson Electronics' powder coated telescoping light mast is durable and can withstand high winds up to 125 mph when lowered to 10 feet. This tower can lift and support up to 150lbs of equipment and is suitable for temporary lighting, use at construction sites, and for security camera deployment. About Larson Electronics LLC: Larson Electronics LLC is a manufacturer of industrial lighting equipment and accessories. The company offers an extensive catalog of industry-grade lighting and power distribution products for the following sectors: manufacturing, construction, food processing, oil and gas, military, marine and automobile. Customers can benefit from the company's hands-on, customized approach to lighting solutions. Larson Electronics provides expedited service for quotes, customer support and shipments.